The flat bones of the skull begin as highly vascular-ized sheets of embryonic tissue. Undifferentiated cells within these sheets differentiate directly into osteo-blasts and form a radiating network of bony spicules lying parallel to the surface of the brain. 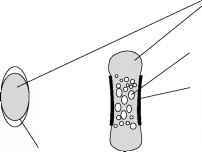 During growth, successive generations of osteoblasts add new bone to the outside and periphery of this structure, while osteoclasts resorb from the inner surface to maintain proportional thickness and shape. Figure 2 The principal stages of embryonic long-bone growth. Figure 3 Continued longitudinal growth at the growth plate.